Du bist hier: Startseite / News / Allgemein / Welcome on the World ❤️❤️❤️!!! Welcome on the World ❤️❤️❤️!!! 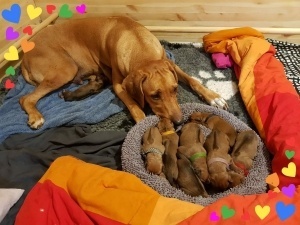 Today we can proudly announce the Birth of our little Wonders from our beloved Friend Laura Tomasi with her Kennel Rock the Ridgebacks in Italy. Mommy Bell and all 9 puppies are very active and healthy- all of them with a beautiful Ridge and perfect Crowns, we are sooo happy and proud ❤️❤️❤️!!! http://www.kokayi.de/wp-content/uploads/2015/04/logo_trans_kl.png 0 0 Markus Groh http://www.kokayi.de/wp-content/uploads/2015/04/logo_trans_kl.png Markus Groh2018-08-24 10:50:582018-08-24 10:50:58Welcome on the World ❤️❤️❤️!!! Cubi was on Fire ❤️❤️❤️!!! A wonderful Football Team is born ❤️❤️❤️!! !